Here is a prime example of how you can express yourself with your stole. 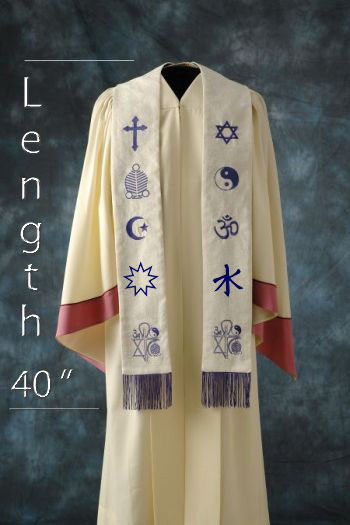 This Medium Interfaith Stole can feature as many as 11 symbols (5 on each side plus one at the apex). The base price for this stole is $118. Add $7.00 for each symbol and let us know where you'd like them placed. Lay out your symbols in this order. For example, in the image the symbol in Position 1 is the Cross. In Position 6 is the Star of David. Resonably priced, easy to work with and beautiful stoleI was fortunate to be guided to Oneness Interfaith for a custom made stole. Originally, I was only going to get the long stole but decided to get a medium stole as well. I will never regret that decision. From start to finish, Oneness Interfaith made the process very easy, even when I made a minor change. When the stole arrived, it was more than I imagined. The craftsmanship is impeccable and the stole is beautiful.